Herbert C. Kelman is the Richard Clarke Cabot Professor of Social Ethics, Emeritus, at Harvard University and was Director of the Program on International Conflict Analysis and Resolution at Harvard’s Weatherhead Center for International Affairs from 1993 to 2003. He has been engaged for many years in the development of interactive problem solving, an unofficial third party approach to the resolution of international and inter-communal conflicts, and in its application to the Arab-Israeli conflict, with special emphasis on its Israeli-Palestinian component. He is the past president of the International Studies Association, the International Society of Political Psychology, the Interamerican Society of Psychology, and several other professional associations. 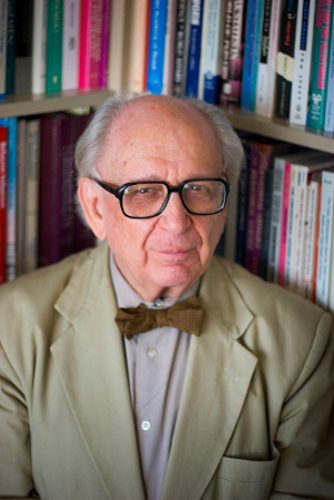 He is the recipient of many awards, including the Socio-Psychological Prize of the American Association for the Advancement of Science (1956), the Kurt Lewin Memorial award (1973), the American Psychological Association’s Award for Distinguished Contributions to Psychology in the Public Interest (1981), the Grawemeyer Award for Ideas Improving World Order (1997), and the Austrian Medal of Honor for Science and Art First Class (1998). His major publications include International Behavior: A Social-Psychological Analysis (editor; 1965), A Time to Speak: On Human Values and Social Research (1968), and Crimes of Obedience: Toward a Social Psychology of Authority and Responsibility (with V. Lee Hamilton; 1989). He received his Ph.D. in Social Psychology from Yale University in 1951.